Some of you may have remembered when my mom did a review of Tints of Nature a few months back.She really loved it. It was like no other hair coloring she had tried before and she loved the color she selected. But wouldn't any one of you who dye their hair at home, really like to know what shade is meant for you, by your own personal color consultant? Well, Tints of Nature is making that come true for one lucky Canadian reader! One of our readers will win a specialized hair consultation from Tints of Nature. Once the winner is selected, a certified stylist will recommend a shade for you, based on your submitted headshot. That winner will also recieve the color that is selected for them, from Tints of Nature.No more guessing what shade you "should be"! Tints of Nature is a highly effective range of 24 conditioning permanent hair colours. It employs an advanced formula to produce outstanding results whilst protecting and caring for your hair and scalp as naturally and gently as possible. 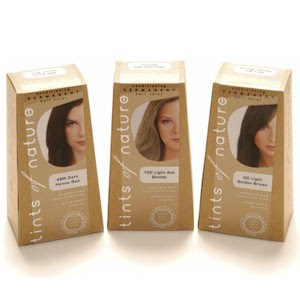 Tints of Nature is the only range of hair colours to use high quality, certified organic ingredients. It contains no harsh chemicals, such as resorcinol or nonoxynol, thus guaranteeing damage free results without compromise. A random draw for this wonderful giveaway will be held on February 1, 2012 by Random.org from all Canadian entries received. I want to win it, because first I want to find the right colour for me and second I found that all other hair colours make my scalp etchy, because of chemicals they have(may be not I am not a big specialist in that), better ask a stylist. Looking for something natural. I would like to win it because I am always looking for healthier hair colours. Mostly the ones without PPD or ammonia. I would love to win so I could know the right color for me! I would love to win this because I always have a horrible time trying to pick the perfect hair colour! A little advice would help! I would love to win so that I know which colour is best for me. I'd love to win because I love the colour selection and because I need someone to help me figure out what colour will make my eyes pop!! !